Red White Blue 5 Lines Slots has not been reviewed yet, be the first to rate this slot. Red White Blue 5 Lines slot has 3 reels and 5 paylines. It’s a classic slot which was designed by Top Game, and it includes a top jackpot of $20,000. The features include a wild symbol, but nothing else. 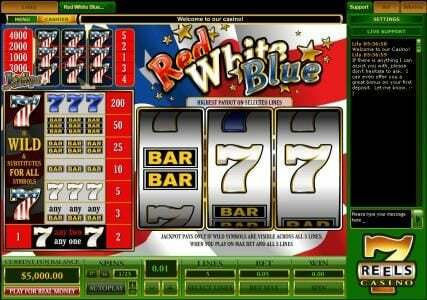 A number of Red White Blue Slots exist, all designed by the same company, with the same graphics and symbols, but with one major difference, the number of paylines included. This is the version with 5 paylines. The symbols which were used include the 7 with the American Flag colors, the blue 7, the white 7 and the usual Bar symbols (in the triple, double and single variants). Because this is a game with 5 paylines, the maximum bet which can be made is 5 coins, or $25, with a top value for each coin of $5. The minimum bet and coin value is $0.01. By placing the maximum bet on a spin, the player has a chance of winning the game’s big jackpot, which is between 1000 and 4000 coins, with a maximum value of $20,000. The slot’s wild symbol is the 7 which uses the American flag theme. Three of these wilds will award the game’s big prize, but its size is influenced by the payline on which the symbols appear. By using bigger size bets, more paylines are available, and the potential size of the jackpot keeps growing as well. Since it’s a wild symbol as well, this 7 will substitute for the other five symbols of the game, creating winning combinations when it is possible. The next symbol, as far as the prize value is concerned, is the blue 7 symbol. This symbol awards a prize of 200 coins (up to $1,000), as long as three of them appear on one of the active paylines. Next, come the Bar symbols, with the triple Bar offering the highest prize, and the single Bar offering the lowest of the three. The last symbol, and the one that awards the smallest prizes, is the white 7 symbol. The slot includes an AutoPlay feature as well, giving players the chance to leave the Slot to spin the reels on it own, for a predetermined number of games. The 5 payline version of Red White Blue has its advantages, namely the higher number of paylines that the player can use and win with. The jackpot however is largest in the simpler version of the game.